David Trachtenberg is president and CEO of Shortwaver Consulting. He served as Principal Deputy Assistant Secretary of Defense for International Security Policy and as a professional staff member of the House Armed Services Committee. In this op-ed, Trachtenberg responds to events in Ferguson, Missouri by advocating an increasing in the transfer of non-lethal weaponry from the military to police. Robert Beckhusen rebuts that argument here. For nearly two decades, the Pentagon has given surplus military equipment to civilian police departments across the United States. Now this cooperation—part of the so-called “1033 program”—is in jeopardy owing to events in Ferguson, Missouri. On Aug. 9, white St. Louis County police officer Darren Wilson shot and killed an unarmed black man, 18-year-old Michael Brown. There were riots and demonstrations. The county police responded with what has been characterized as military-style force. The cops’ methods underscored widespread concerns over the use of lethal force by law enforcement agencies—and have led critics to demand the “de-militarization” of civilian police. Now some lawmakers in Congress are considering legislative changes to the 1033 program to tighten restrictions on the transfer of military equipment. The changes could also affect the transfer and joint development of hardware that’s actually useful for law enforcement, including non-lethal weapons that can minimize the risk of civilian casualties. Restricting police access to non-lethal weaponry would be a mistake. Rep. Hank Johnson, a Georgia Democrat and a member of the House Armed Services Committee, has said local police forces “are beginning to resemble paramilitary forces.” He plans to introduce legislation that would curtail the Pentagon’s ability to transfer military equipment to civilian agencies. Democratic Sen. Carl Levin of Michigan, chairman of the Senate Armed Services Committee, has indicated his committee will review the 1033 program before its version of the National Defense Authorization Act goes to the Senate floor for debate. As is often the case when emotions run high, overreactions follow. Few people would advocate turning local police forces into another branch of the armed forces. But there are alternatives that can help maintain law and order without making towns like Ferguson look like Fallujah. We need a deliberate and comprehensive review of the equipment-transfer program in order to identify military capabilities that are most suitable for the police. 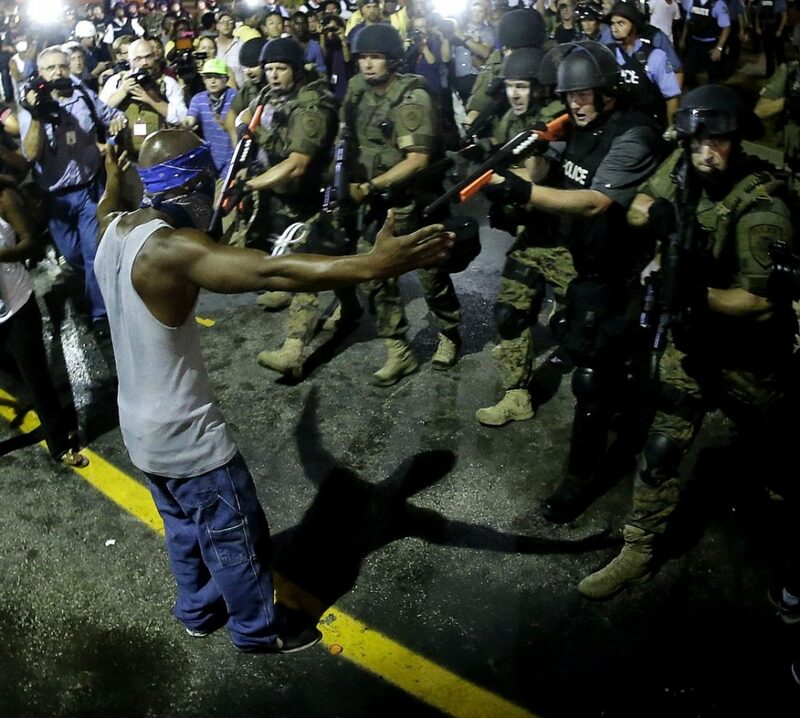 Bearing in mind the lessons of Ferguson, such a review should enhance military-to-civilian equipment exchanges—especially when it comes to non-lethal weapons. The Defense Department established its non-lethal weapons program in order to develop “reversible effects” capabilities—in other words, weapons that don’t kill. They range from blunt impact munitions—like shotguns firing beanbags—to advanced directed energy systems that can cause discomfort or irritation or even temporary deafening. Solid-state active denial technology, for instance, relies on focused, invisible millimeter-wave energy—similar to airport scanning technology—to create a burning sensation on the surface of the skin … and an immediate impulse to get out of the way. Among its many applications, ADT shows particular promise for crowd dispersal. It’s remarkably effective, as proven in no fewer than 11,000 individual tests. The military has years of experience using non-lethal weapons in overseas wars. They’ve helped to quell unrest, defend American and allied forces and protect innocent civilians and bystanders while minimizing unintended damage to property and loss of life. We need to fix this disconnect. While non-lethal systems have proved effective in overseas contingency operations, they also have relevance to a broad range of homeland defense and domestic security scenarios, including responses to natural or man-made disasters. The question is, in light of the events in Ferguson, will domestic law enforcement agencies be more or less willing to use these non-lethal capabilities? And will we allow the Pentagon to transfer—or jointly develop with civilian law enforcement—non-lethal systems as viable alternatives to lethal force? As we debate the 1033 program, the Department of Homeland Security should look seriously at the role that non-lethal weapons can play in addressing domestic security problems. The Defense Department should redouble its efforts to develop and procure state-of-the-art non-lethal systems and rethink its proposed budget cuts to these programs. And Congress shouldn’t limit the transfer of sensible military equipment, including non-lethal weapons, to law enforcement.